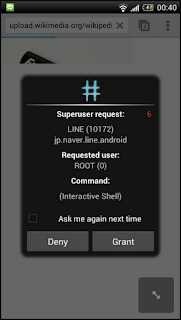 Japan Mobile Tech: Naver's Line app need root permissions? LINE is operated by NHN Japan, the subsidiary of NHN in Korea, the country's biggest web company with a US$11 billion market cap. It's listed at the Seoul Stock Exchange and was founded in 1999. Even NHN Japan has over 1,000 employees and is active over here since 2000 ;). That obviously mean you can automatically trust them, but this company is certainly not unknown. Thanks as always for the insight, Serkan. I attempted to qualify that statement with relatively, as in relative to the Microsoft, Apple, Google, Yahoo!, Skype, et al., with the implication being that, due to their global presence, the former companies must comply with the privacy laws of many countries and are therefore less likely to engage in shady behavior with respect to the handling and securing of the personal information they collect. I just installed it and it didn't ask for root, I am guessing someone made a mistake with one of the updates. Running LINE since months ago and it never asked for root. Did you get your LINE installer through Play Store?